Map showing land annexations and Richfield's original borders as a town in 1854 and present day borders as a city. The beginnings of Richfield date back to the 1850s, when it was still a small farming community. Close to Minneapolis and Fort Snelling, it was on the edge of a growing and expanding city with business and commerce not far away. One of the first settlers was Riley Bartholomew, a former General in the Ohio Militia who became a Richfield Justice of the Peace and a Minnesota State Senator. Bartholomew built a house on the east shore of Wood Lake in 1852, and the restored Riley Lucas Bartholomew House is listed on the National Register of Historic Places. Today, the house and site are maintained by the Richfield Historical Society. In the early days, Richfield extended as far north as Lake Street, and included present day Edina and parts of St. Louis Park and Hopkins on the west, and extended to the Mississippi and the Minnesota Rivers on the east, and to Bloomington on the south. On May 11, 1858, as Congress was admitting Minnesota into the Union, the early residents of Richfield had their first town meeting. That same year Richfield was named for the fertile farm land it encompassed. By 1879, the community's first town hall was constructed. Early residents were German, Irish and families from the New England area. These residents were soon joined by immigrants from Sweden, Norway and Denmark. It was not until 1908 that Richfield became a village. From 1908 until 1950, Richfield's local government consisted of a President, three trustees, and a clerk. On November 7, 1950, residents voted for a city manager form of government, meaning the city had a Mayor, four council members, and one City Manager. This is still the form of government used today. Richfield's first Mayor was Clarence Christian, who began serving in 1951, but served as President under the old format dating back to 1948. By the late 1940s, the city's population started increasing rapidly as farmland was sold to developers who were building homes for veterans returning from World War II. In 1955, the Richfield Chamber of Commerce was formed and has been deeply involved in the development, as well as the redevelopment, of the community since that time. The first half of the 20th century also saw the boundaries of Richfield change, as annexations decreased the size of the city. Three annexations by Minneapolis brought the village to 62nd Street, its present north boundary. In 1886, St. Louis Park formed a separate community followed by Edina in 1888 and a section of the far west was annexed by Hopkins in 1893. In 1905, a section of the east to 34th Avenue was requisitioned by Fort Snelling. In 1941, another section of East Richfield went to the Minneapolis–Saint Paul International Airport, and by 1955 all of the Wold-Chamberlain Field (municipal airport) was separated from the village. Over the years, populations of all nearby communities increased and after World War II, Richfield flourished with commuters to Twin Cities jobs. Today, Richfield has a population of about 35,000 residents who live within seven square miles of neighborhoods, parks and shops. According to the United States Census Bureau, the city has a total area of 7.01 square miles (18.16 km2), of which 6.87 square miles (17.79 km2) is land and 0.14 square miles (0.36 km2) is water. Interstates 35W and 494 and Minnesota State Highways 62 and 77 are four of the main routes in the city. Other main routes include 66th Street. The majority of the 10,000 single-family homes were constructed in the 1950s, and the 5,000 apartments date from the 1960s and early 1970s. The Richfield Rediscovered Housing Program has established an environment of change in the community as it encourages home remodeling, expansion, and reconstruction. The program is gradually changing the face of Richfield's residential neighborhoods, upgrading them from small, post-WWII styles to larger homes. Best Buy Company, Inc. moved its corporate headquarters into the city in 2003, becoming the largest employer in Richfield. Job growth in Richfield has reached unprecedented levels in recent years. From the first quarter of 2001 to the first quarter of 2003, net job growth equaled 2,444 – the second highest in the metropolitan area. Additionally, total employment in Richfield jumped from 10,090 to nearly 15,000 between 1995 and 2005. In 2007, Cedar Point Commons opened in Richfield at Cedar Avenue and 66th Street, adjacent to Minneapolis–Saint Paul International Airport. SuperTarget and The Home Depot serve as its anchor tenants. Richfield has public schools, private schools, alternative education programs, and post-secondary options. The school district, Independent School District 280, serves about 4,200 students in Richfield and part of Edina in grades K-12. Richfield schools are divided into elementary schools, middle schools, and high schools. Four elementary schools serve primary students in grades K-5: Centennial Elementary; Sheridan Elementary; R-STEM Elementary, which focuses its curriculum on science, technology, engineering, and math; and RDLS Elementary, a dual language school which teaches students in both English and Spanish. Students in grades 6-8 attend Richfield Middle School. Richfield High School serves approximately 1400 students in grades 9-12. Outside of the school district there is Watershed High School. Richfield has more than 450 acres (1.8 km2) of parkland, 23 neighborhood parks and a nature preserve. Wood Lake Nature Center is a 150-acre (0.6 km2) park operated by the city of Richfield that features wetlands, walking paths and an interpretive center. When the Nature Center opened in 1971, it was one of the first urban nature centers in the United States, and is currently home to more than 200 different kinds of birds and 30 mammals. Richfield's Ice Arena has two full-size indoor skating rinks. Hockey games, figure skating, broom ball games, open skating, and community events all take place in this facility. Located near the ice arena is Richfield's outdoor pool. Renovated in 2003, the swim complex features a 50-meter competitive pool, wading pool, and a 28-foot (9 m) double waterslide. As of the census of 2010, there were 35,228 people, 14,818 households, and 8,420 families residing in the city. The population density was 5,127.8 inhabitants per square mile (1,979.9/km2). There were 15,735 housing units at an average density of 2,290.4 per square mile (884.3/km2). The racial makeup of the city was 69.8% White, 9.2% African American, 0.8% Native American, 6.1% Asian, 0.1% Pacific Islander, 10.4% from other races, and 3.5% from two or more races. Hispanic or Latino of any race were 18.3% of the population. There were 14,818 households of which 26.7% had children under the age of 18 living with them, 41.2% were married couples living together, 10.8% had a female householder with no husband present, 4.9% had a male householder with no wife present, and 43.2% were non-families. 34.3% of all households were made up of individuals and 12.9% had someone living alone who was 65 years of age or older. The average household size was 2.35 and the average family size was 3.05. The median age in the city was 36.2 years. 21.3% of residents were under the age of 18; 8.5% were between the ages of 18 and 24; 31.4% were from 25 to 44; 24.7% were from 45 to 64; and 14.2% were 65 years of age or older. The gender makeup of the city was 49.2% male and 50.8% female. As of the census of 2000, there were 34,439 people, 15,073 households, and 8,727 families residing in the city. The population density was 4,993.9 people per square mile (1,927.1/km²). There were 15,357 housing units at an average density of 2,226.9 per square mile (859.3/km²). The racial makeup of the city was 81.25% White, 6.65% African American, 0.72% Native American, 5.30% Asian, 0.04% Pacific Islander, 3.41% from other races, and 2.64% from two or more races. Hispanic or Latino of any race was 6.27% of the population. There were 15,073 households out of which 24.4% had children under the age of 18 living with them, 43.4% were married couples living together, 10.5% had a female householder with no husband present, and 42.1% were non-families. 33.7% of all households were made up of individuals and 12.0% had someone living alone who was 65 years of age or older. The average household size was 2.25 and the average family size was 2.89. In the city, the population was spread out with 20.2% under the age of 18, 9.3% from 18 to 24, 33.4% from 25 to 44, 20.7% from 45 to 64, and 16.4% who were 65 years of age or older. The median age was 37 years. For every 100 females, there were 96.2 males. For every 100 females age 18 and over, there were 93.0 males. The median income for a household in the city was $45,519, and the median income for a family was $56,434. Males had a median income of $38,417 versus $29,909 for females. The per capita income for the city was $24,709. About 3.9% of families and 6.3% of the population were below the poverty line, including 8.3% of those under age 18 and 3.8% of those age 65 or over. The current Mayor of Richfield is Maria Regan Gonzalez, who is the first Latina mayor in Minnesota history. She was preceded by Pat Elliot. Maria Regan Gonzalez was a councilwoman in Ward 3 before being elected in 2018. Richfield has five city council members, which include Mary Supple (Council At-Large), Simon Trautmann (Council Ward One), Edwina Garcia (Council Ward Two), and Ben Whalen (Council Ward Three) and Mayor Regan Gonzaelez. At the state level, Richfield is represented by DFLers, including state Sen. Patricia Torres Ray and state representatives Jean Wagenius and Michael Howard. The city is located in Minnesota's 5th congressional district, represented by Ilhan Omar, a Democrat. Steve Christoff – member of the 1980 USA men's hockey team that won the gold medal in the Miracle on Ice. ^ cmhehre. "Richfield Campus". Seven Hills Preparatory Academy. Retrieved 2019-03-13. ^ "Parks". City of Richfield, Minnesota. Archived from the original on 14 May 2013. Retrieved 18 August 2013. ^ "Woodlake Nature Center". City of Richfield, Minnesota. Archived from the original on 14 May 2013. Retrieved 18 August 2013. ^ "Ice Arena". City of Richfield, Minnesota. Archived from the original on 21 March 2014. Retrieved 18 August 2013. ^ "Outdoor Pool". City of Richfield, Minnesota. Archived from the original on 12 May 2015. Retrieved 18 August 2013. ^ United States Census Bureau. "Census of Population and Housing". Archived from the original on May 12, 2015. Retrieved June 15, 2013. ^ "Minnesota State Senate". www.senate.mn. Retrieved 2019-03-13. ^ "Rep. Jean Wagenius (63B) - Minnesota House of Representatives". www.house.leg.state.mn.us. Retrieved 2019-03-13. ^ "Rep. Michael Howard (50A) - Minnesota House of Representatives". www.house.leg.state.mn.us. Retrieved 2019-03-13. Johnson, Frederick L. (2008). 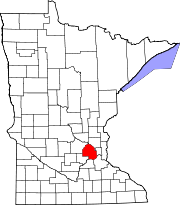 Richfield: Minnesota's Oldest Suburb. Richfield Historical Society. ISBN 978-1-60585-636-0. Smetanka, Mary Jane (11 February 2008). "Richfield, the state's 'oldest suburb'". Star Tribune. Wikimedia Commons has media related to Richfield, Minnesota. Wikivoyage has a travel guide for Richfield, Minnesota. This page was last edited on 6 April 2019, at 21:31 (UTC).